Place value games are a great way to break the routine of studying, while still strengthening your skills. You can practice with friends or by yourself. Below are some fun place value activities that you'll likely enjoy. Finding place value is all about understanding how numbers can be grouped together and counted. You can practice separating 2-digit numbers into groups with this exercise. Using index cards, write a 2-digit number on each one (like 12 or 79). Below the number, draw two horizontal lines and write 'tens' underneath the line on the left and 'ones' under the right-hand line. To begin, both players should be holding a pen. Give half of the cards to the other player and say, 'go.' Write the correct digits on the 'tens' line and the 'ones' line as fast as you can. Whoever finishes first - and has the correct answers - wins. For the number 12, each players should have 'one' written on the 'tens' line and 'two' written on the 'ones' line. For 79, the seven goes in the 'tens' place and the nine in the 'ones' place. On a piece of paper, identify the 'tens' and 'ones' places for each of the following numbers. In the answers below, the number in the tens place is bold and the number in the ones place is underlined. One fun way to get used to place value is to count loose change. Find a pile of change from around the house. Now divide the change by type, so all the pennies are together, all the nickels are together and so on. The penny represents one hundredth of a dollar ($0.01). Similarly, a dime represents one tenth of a dollar ($0.10). These are place values used in decimals. Next, count how many pennies you need to equal a dime, how many nickels you need for a quarter and all the other combinations you can think of. We group coins by ones, fives, tens and 25 cents because that makes it easy to count money quickly. Imagine what it would be like if you had to pay for everything in pennies. Sounds awful, right? Well, this is why place value is useful. When you buy something for $2.55 cents, you might hand the cashier a 5-dollar bill. He then has to count up from $2.55 to $5.00 to figure out how much change you need. In order to calculate change, the cashier must have an understanding of place value because he must add and subtract using decimal place values. 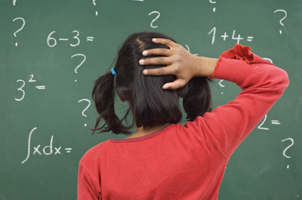 Elementary students may think math is limited to the textbook and the classroom. But families and educators can find excellent math lessons by examing the world around them. Read on to learn more about finding mathematics in the world you live in.